Mahara is being improved constantly. On this page, you see the highlights for the latest release of Mahara. SmartEvidence allows you to work easily with competency frameworks associating your portfolios to certain competencies, skills or attributes. At the same time, you also have a visual overview of your progress to date. 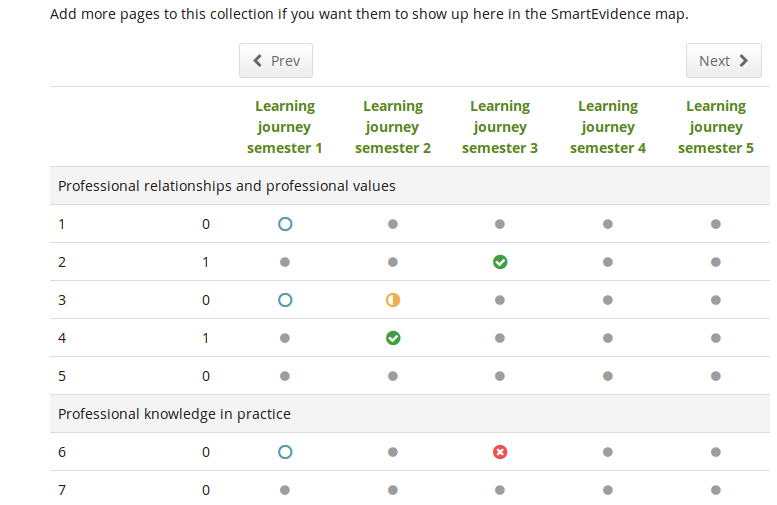 Upload a SmartEvidence file and associate a collection with a framework to find out how SmartEvidence works. This feature is experimental, but we wanted to make it available to you already early on in the development to gather feedback. You can view a pre-release demonstration of the feature. Mahara Mobile is the new Mahara app that allows you to collect and create learning evidence offline and then upload it to Mahara when you have an internet connection again. 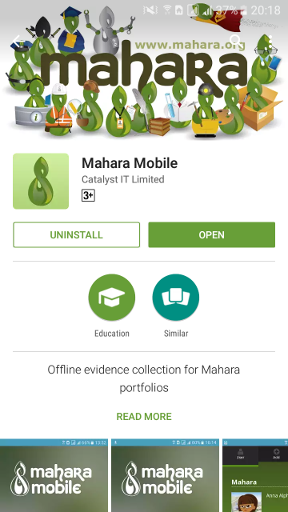 Mahara Mobile replaces MaharaDroid and Portfolio Up. In order to use Mahara Mobile, you need Mahara 16.10 as there are a number of web services changes that were made. Mahara Mobile is available for Android and iOS devices. Mahara Mobile can be used with external authentication methods. Site administrators need to enable and configure the mobile API, and individual users can view their connected devices. View the compatibility table to find out, which browsers support these formats. When a comment is deleted that doesn’t have any other comments following, the information “Comment deleted by author / owner” is hidden as that information is not needed for context. See the section “Page comments” for more information. You can copy the configuration of the Tagged journal entries block to another page to provide a more complete template when using the block in one. See the block configuration description for more information. When you create a skin, the default setting is to keep it private to prevent oversharing of unfinished skins and make the sharing a conscious decision. Find out how you can create a skin. Forms containing required fields are marked more clearly for accessibility reasons. The sentence Fields marked by ‘*’ are required. is that indicator. You can copy your own groups as group administrator on the group homepage or as site administrator on Administration → Groups → Administer groups. Copying a group takes along the group settings, files, journals, pages and collections. It does not copy members or forums. If you need to make many changes to the membership of a group, download the CSV file containing the members, make your changes and upload it again. Site administrators have access to that feature on Administration → Groups → Administer groups. You can download the group settings of any group, no matter whether created manually or via CSV on Administration → Groups → Administer groups. That allows you to administer these groups in bulk and upload settings changes for multiple groups at once. Users that are suspended or expired are highlighted in the user search in the administration for institution and site administrators to see them more easily when they come up in user searches. See the “User search” in the Administration. An institution’s short name is important for setting up SmartEvidence when you want to restrict a competency framework to a particular institution. Once a new institution is created, the short name is displayed on the institution’s setting screen. A number of elements are cached in Mahara on the system level to speed up the site. In some cases, you may wish to force a new version though if the browser doesn’t recognize it on its own. You can clear the caches easily via the “Clear caches” button on the Admin home page if you are a site administrator. SimpleSAMLphp is a managed dependency in Mahara, which means that it is installed as part of the Mahara codebase. You may need to install a few more dependencies manually that are expected to be present. If that were the case, Mahara would alert you to that fact on the SAML plugin configuration page. You can configure SAML and SAML-based authentication methods for institutions. You can now also enable user account auto-creation via SAML on multi-tenanted sites as the previous restriction is not needed anymore. Mozilla discontinued Persona authentication, and we needed to remove it. You can migrate all Persona account to internal authentication automatically to allow your users to log in if they previously used Persona. There are a few additions and changes to the web services implementation in Mahara. A connection manager is available (documentation to come) to facilitate connections to other systems.